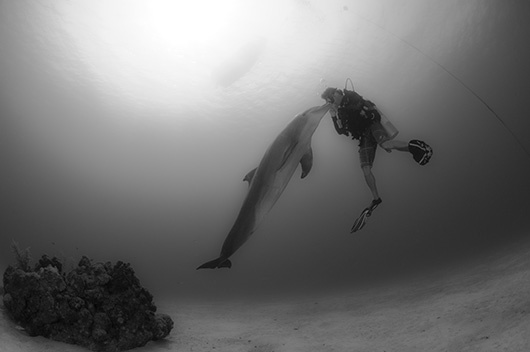 Edwar, who placed 3rd in the 2010 Ocean Art contest for wide-angle, shares his experience on the Utila Aggressor II. 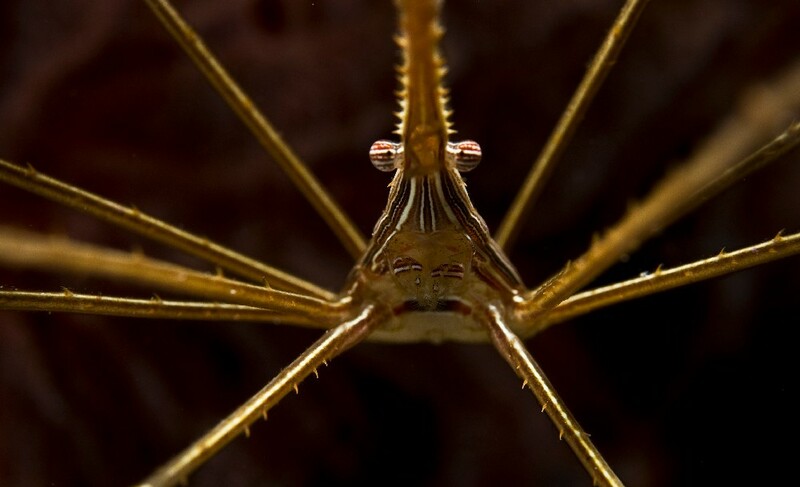 Underwater photographer Edwar Herreno won this trip aboard the Utila Aggressor II by placing third in the wide-angle category in Underwater Photography Guide's 2010 Ocean Art Photo Contest. Here is his story. The Bay Islands of Honduras are located at the southern end of the Belize Barrier Reef. Made up of three distinctly different islands, the Bay Islands have something for everyone. Roatan is a large island surrounded by beautiful white sandy beaches, and features legendary shark diving. Guanaja is an exclusive resort paradise that few can afford to experience. Utila, on the other hand, is considered the "Mecca” for divers; an island purely devoted to diving and partying that manages to attract both frugal backpackers and all-inclusive vacationers. 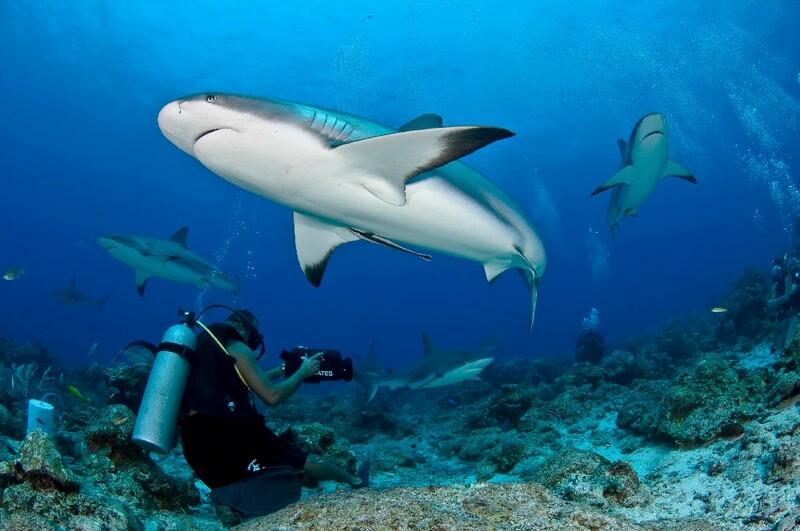 Caribbean reef sharks. Nikon D300 in a Sea & Sea Housing (MDX D300), Sea & Sea 250 strobes with a diffuser, and a Tokina 10-17mm fisheye lens. F7.1, 1/160, ISO 200 @ 10mm. Guests arriving on the charter flight from San Pedro Sula or Roatan are greeted at Utila Airport and transferred to the Utila Aggressor II. The friendly crew was waiting to assist them in any way possible, as they marveled at the grand beauty before them. Everyone had plenty of time to get settled in their luxurious rooms, and organize their dive gear in their spacious personal lockers. After a delicious dinner, the cruise director gave a briefing, which outlined the safety procedures and the week’s exciting schedule. Later, the crew hosted a "welcome aboard" champagne party which starts onboard and ended at Utila’s bars in town. 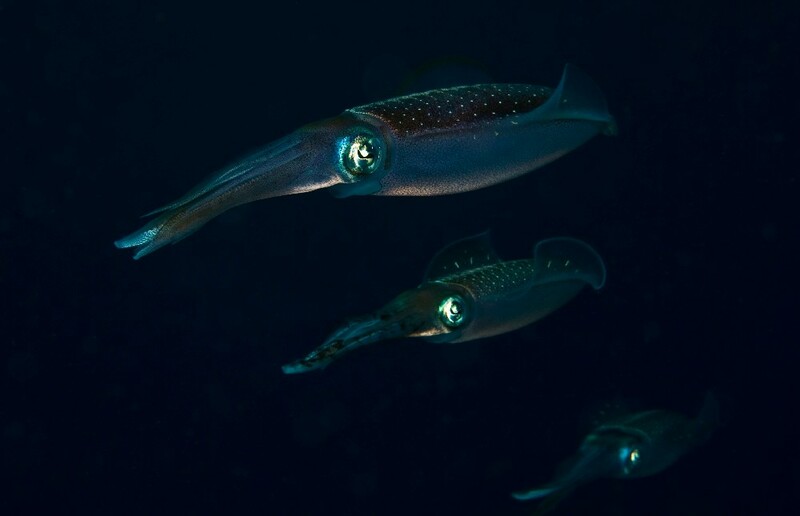 Caribbean reef squid. Nikon D300 with a Nikon 60mm macro lens. F13, 1/125, ISO 200. After a delicious home-cooked breakfast, the week started with a fabulous dive around Utila. The nice, warm (83 F) Caribbean waters had very good visibility (90 – 120 ft) and were full of colors and small critters. There was a huge hermit crab crawling around in the sand, some beautiful flamingo tongues on the fan coral, and a juvenile spotted drum fish and a smooth trunk fish. All dives were made from the large swim platform of the mother ship. Most of the guests enjoyed up to five dives each day, only stopping for one of the many delicious meals, snacks or a nap. Night dives are offered every night after dinner. 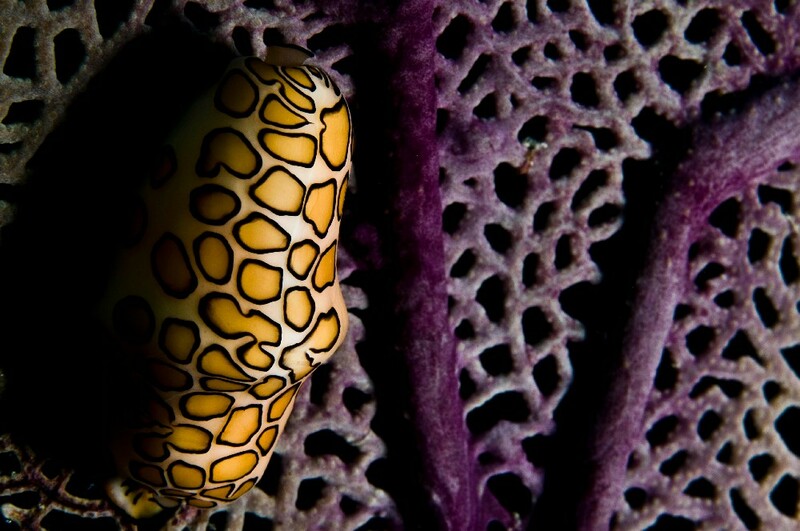 Flamingo tongue snail, captured with a Nikon 60mm macro lens. F25, 1/125, ISO 200. Arrow crab. F9, 1/250, ISO 200. As the warm Caribbean sun shone down on the divers as they awoke, the Utila Aggressor II headed to Roatan. This is a fabulous place to enjoy a few dives on the spectacular walls. We dove with big groupers, hawksbill turtles, and eagle rays. The reef was filled with crabs, cleaner shrimp, sea horses, star fish, lobsters, reef squid and unfortunately, lots of lion fish. We also dove at “El Aguila," a big wreck sunk in 1997, which was full of well-fed gigantic Nassau groupers. 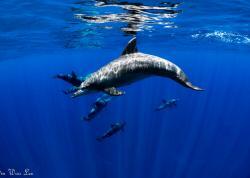 The highlight of our experience at Roatan, however, was to dive with dolphins and Caribbean reef sharks. Nikon D300 with Tokina 10-17mm fisheye lens. F11, 1/100, ISO 200 @ 10mm. 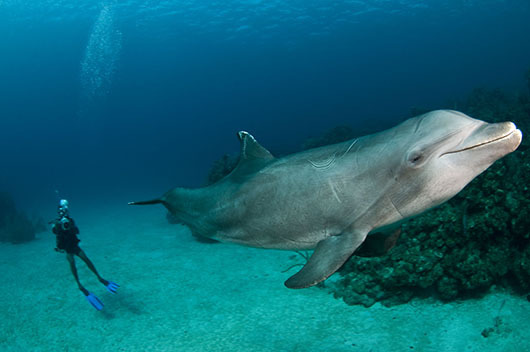 Friendly dolphin in Roatan. F10, 1/100, ISO 200 @ 10mm. 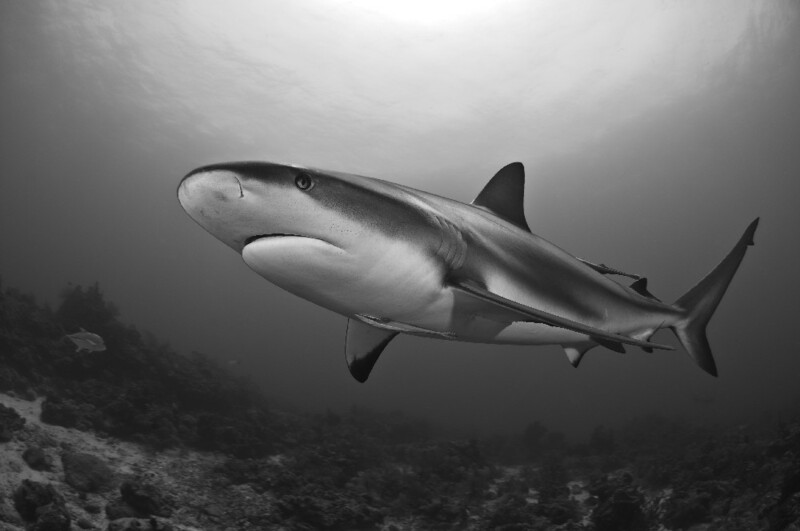 Caribbean reef shark. F8, 1/100, ISO 200 @ 10mm. The boat headed to Coco’s sea mounts, where the ocean floor rises from hundreds of feet to only 40 feet from the surface. 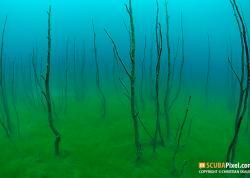 These sea mounts are far from Utila and Roatan; therefore, they are rarely visited by day-boat divers. The reef is in excellent condition since there is less fishing impact, therefore more fish including the lionfish. 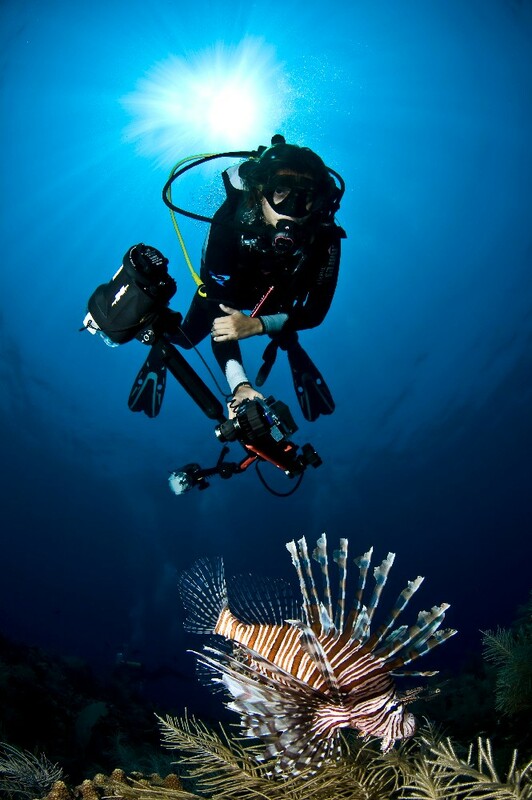 The locals dive operators are trying to control the population of lionfish by fishing with spearguns. Andy, our chef, made a delicious meals including a nice a very taste lionfish ceviche. The Coco's sea mount is a good place to encounter pelagics like rays, turtles, and jacks. Our DM and a lionfish. F16, 1/250, ISO 200 @ 10mm. The final dives of the week were at Cannery Bank. After a nice and relaxing dive it was time to pack our dive gear, download our underwater photos, and explore Utila’s night life. We were very lucky to have Troy Bodden (Utila Aggressor II's owner) as our captain. He was such a nice person full of experience and good stories. Our chef, Anders Svensson, did an spectacular job! He has a passion to create extraordinary cuisine. Our DMs Pete, Saby, and Juju showed us the best of this area and spoiled us with a good stories and great service during the trip. I was very impressed with the Utila Aggressor II, the crew, and the quality of the service. I captured those images using my camera on full manual mode. I would set the exposure using the camera's internal light meter, and prepare to compose the shot. I also use the strobes manually so I can play with the light to create the effect I'm looking for. For the action shots, I shot single-frame capture, as I have yet to experiment with rapid fire mode. I prefer to wait for the right moment and then...click! 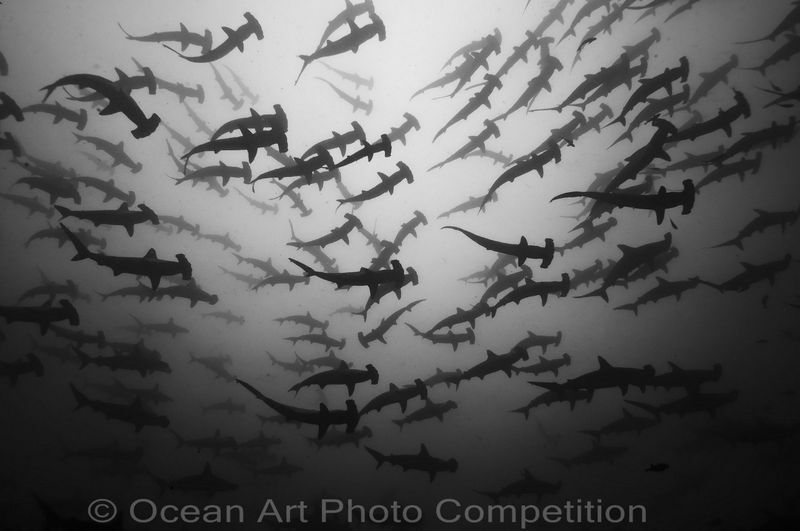 Edwar's 3rd place photograph from the 2010 Ocean Art in the Wide-Angle category, "Hammerheads of Cocos." 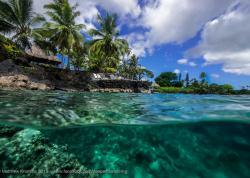 CLICK HERE to learn more about the 2011 Ocean Art Photo Competition, with over $75,000 worth of prizes.